• 860 sqft , 2 bath , 2 bdrm “Concrete” – FOR SALE USD299,000 . THIS IS THE FIXER UPPER OF YOUR DREAMS! Put your own stamp on this 7th floor PENTHOUSE. Do you like rustic beachy comfort? Maybe retro is more your style? Does elegant exotic wood and natural stone suit you best? So easy to customize because this penthouse NEEDS EVERYTHING! No – wait – the existing ceramic tile floors are stylish and really very nice. That’s going to save the new owner a bundle.The front of Kona Alii faces Alii Drive. The ground floor has commercial units. Right across the street is the seawall where people sit to watch the sunset beyond the bay where cruise ships spend the day. Unit 707 sits in the crook of the L shaped building, on the quiet side. 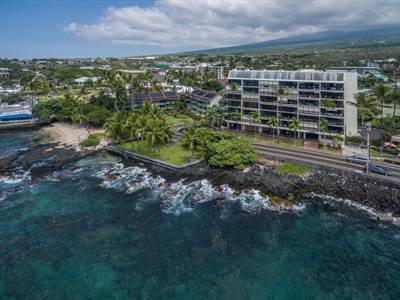 It has two levels with a view of the city from the lower floor and lanai. From the loft and upper sundeck you will see the sunrise across the mountains. Dozens of our favorite restaurants and shops are within easy walking distance for most people. Living in Kona Alii is like being on vacation all the time. The great room on the lower floor is currently 20 x 20 with floor to ceiling, wall to wall sliding doors to let the tropical breezes in. On that level you will also find one bedroom, two baths and laundry hook ups. On hot days you may choose to use the split system AC. Upper level is currently a small loft that opens to a huge sundeck.MORE GOOD NEWS FOR THE DESIGNER! Have you every heard of a condo that would let you build on additional room! Most of the penthouse units have already built out onto the upper floor sundeck increasing the size of the upper floor substantially. How do you want to use the space. Do you want a big office, man cave, guest room or master suite? Unless you just want to enjoy the big outdoor deck, get your plans drawn or modify the ones we have and build it out just the way you want it. AS IS – no repairs. Existing appliances included. No Pets. Owner is a licensed real estate broker. Water/Sewer, Hot water, basic cable, trash pu in monthly fee.